When Hunan and Adore came to the ASPCA at the height of kitten season, they were less than 4 weeks old. The tiny kitties had been found together as strays, and both were suffering from untreated infections that left them with serious eye damage. Though we hoped to keep them together, we were struggling to find one family willing to take both babies home. Fortunately, two roommates from Brooklyn came along and adopted Hunan and Adore—proving that in the end, family is whatever you make of it. Here is their doubly-happy Happy Tail. Sam and Kaylie have been sharing an apartment in Brooklyn since January, when Kaylie moved to New York from California. After a few months together, the lifelong cat-lovers realized that their apartment was missing something very important: a feline! Not content to share a cat, the roomies decided that they each wanted a furry friend of their own, and in May, they headed to the ASPCA Adoption Center. “Kaylie and I both wanted to adopt,” Sam recalls. 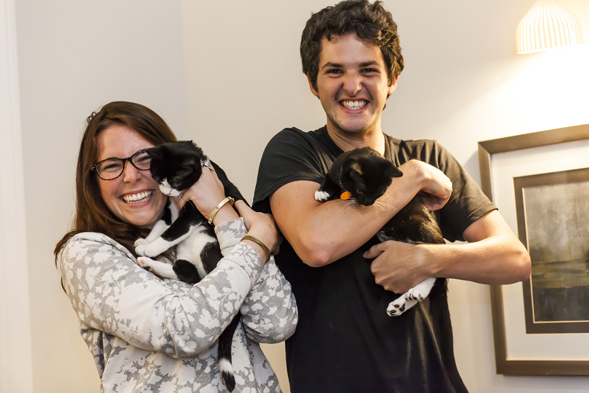 “We thought it would be great to adopt a pair so that when we have to leave the apartment, it will be a bit more bearable.” After meeting many cats, though, the roommates hadn’t found any that felt like the perfect fit. 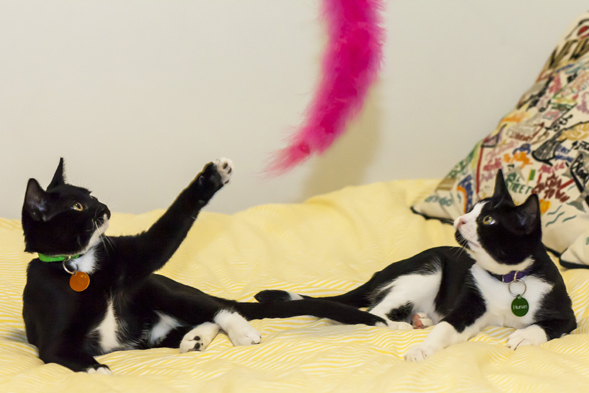 They were nearly ready to leave when they spotted two tiny tuxedo kittens, Hunan and Adore. At just a few months old, Hunan and Adore were far from the adult cats that Sam and Kaylie had envisioned before their visit. But they were drawn to pair and asked to meet them. “We took them out and immediately they started running around and playing with each other and falling all over themselves,” laughs Kaylie. It didn’t take long before one duo was sold on the other. “When Hunan looked at me with her one eye in a perpetual wink, I found her so heart-meltingly charming that I knew she was the one for me,” Kaylie says. Sam felt the same way about Adore: “With the distinguishing white-dipped tail, I knew my kitten was a star.” The new foursome headed home together that very same day. Back at home, Sam and Kaylie’s new four-legged roommates settled in easily. “There was barely an adjustment—they both took to the apartment almost immediately!” Kaylie tells us. “Having a buddy throughout the whole move seemed to give them both an added boost of courage,” adds Sam. To help provide more Happy Tails for deserving animals like Hunan and Adore, please consider making a donation to the ASPCA today.